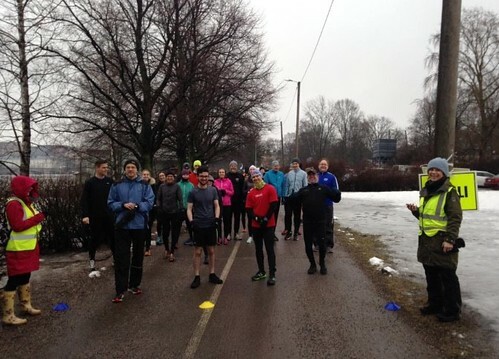 In parkrun circles there is an oft repeated maxim – ‘it never rains at parkrun’. 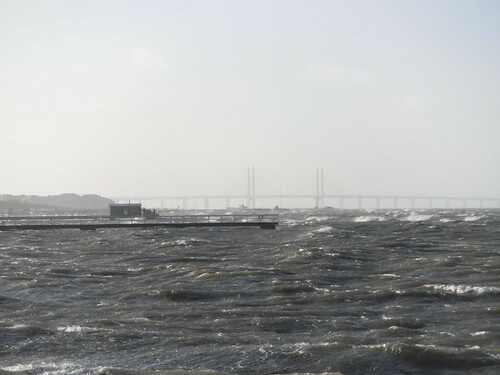 This refers to the curious phenomenon that regardless of the forecast there will be a window between 9 and 10 am on Saturday morning during which any bad weather will hold off, allowing parkrunners to complete their 5k run with the elements on their side. This phenomenon is part of what makes parkrun a little bit magical, and is attributed to the ‘parkrun weather fairies’ that allow for ideal weather conditions during the event. Now I’m not going to comment on the existence or otherwise of such supernatural beings. But what I will say is that if they do exist then they weren’t following their work instructions correctly this weekend. 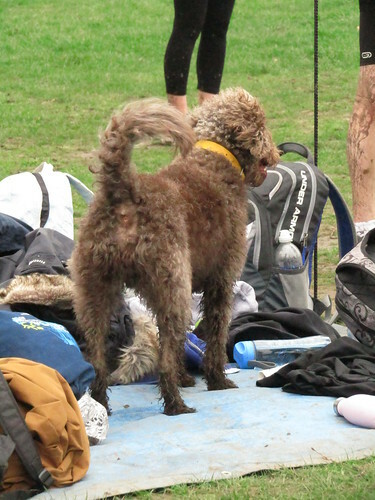 Conditions throughout the 143rd parkrun on Tooting Common were damp and drizzly. 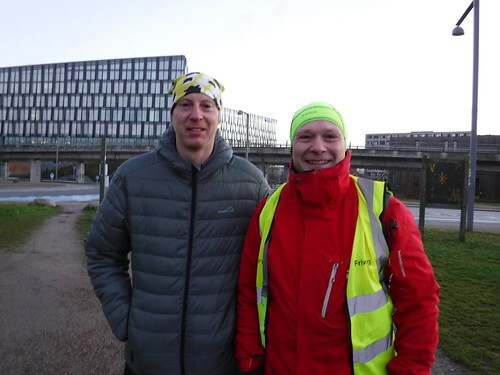 However, those taking part were given a wonderful welcome from the dedicated volunteers in hi-vis jackets who turn up whatever the weather to make sure that each parkrun event occurs. 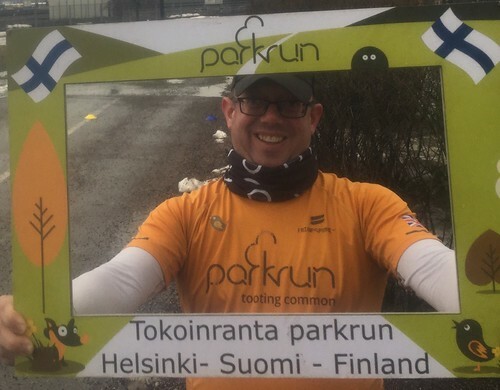 I am a keen parkrunner, and have completed 181 parkruns. 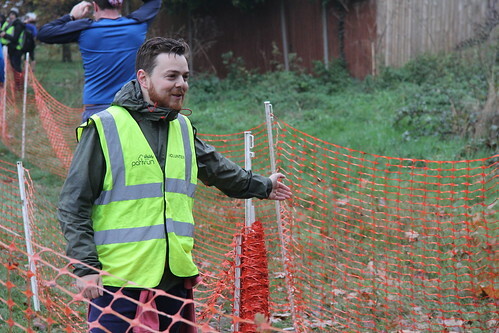 However, I have always made sure I volunteer on a regular basis too, and have been involved at Tooting Common parkrun since the very beginning. I thoroughly enjoy helping out and today marked the 100th time I have done so at Tooting. 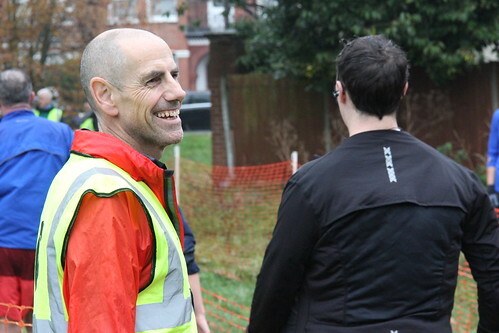 And I would encourage you all to get involved on the volunteering side of parkrun when you are able to do so. Volunteering is immensely rewarding and can give your self-confidence a massive boost. None of the volunteering roles are that complicated, and you might well surprise yourself with the amount of responsibility you find you can take on. And if you help out at 25 events, you can get hold of one of the purple ‘25’ running shirts that you might have seen some runners and volunteers wearing. 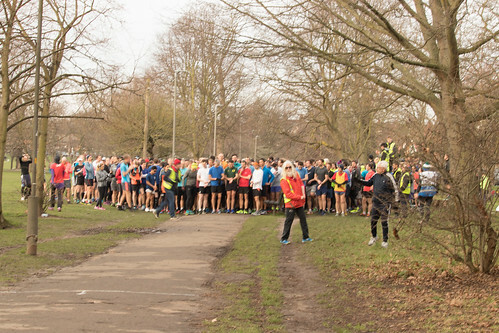 Perhaps unsurprisingly given the weather, there were only 371 runners, joggers and walkers going round the Tooting Triangle on Event 143 – about two thirds of the attendance the previous week. 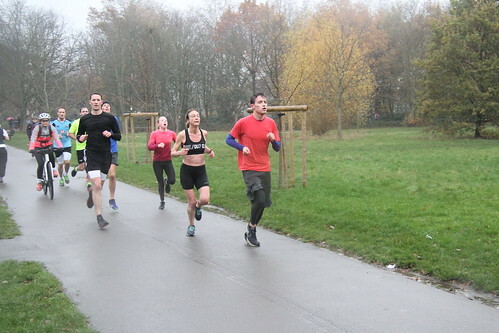 However, the rain did not deter 46 first timers on the day, of whom 26 were running their first ever parkrun. 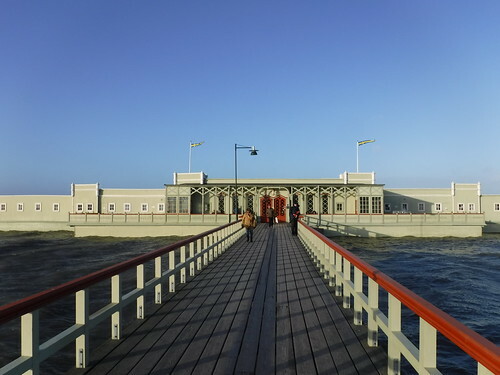 Welcome, and we hope to see you all again soon! - Amina KHATIB improved on her run earlier this month by an amazing 2 minutes and 50 seconds to cross the line in 42:38. Well done, Amina! Finally, milestone shout outs are due to Richard BOGLE, who ran his 100th parkrun today, and to Emma HAINSWORTH and Isabal ROTHON who both ran their 50th. 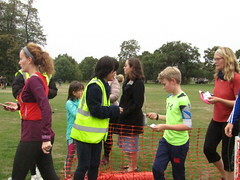 In addition, George FREEMAN ran his 10th parkrun as a junior and can now claim a white milestone t-shirt. Congratulations to you all! Gavin ABBS (SM30-34) was first over the line in a new PB of 17:34. Chris GRAHAM (VM40-44) of Serpentine RC was third over the line in 17:44. Ruth Jean CHALMERS (SW30-34) of Herne Hill Harriers was first over the line in 20:52. Helen OLDFIELD (VW50-54) of Herne Hill Harriers RC was second over the line in 21:43 – equalling her course PB in the process. 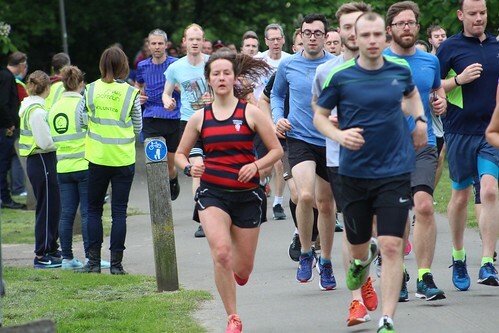 Laura CHESHAM (SW30-34) of London City Athletics Club was third over the line in 21:59.
parkrun is organised by volunteers and the event team need help every week, so why not help out now and again? 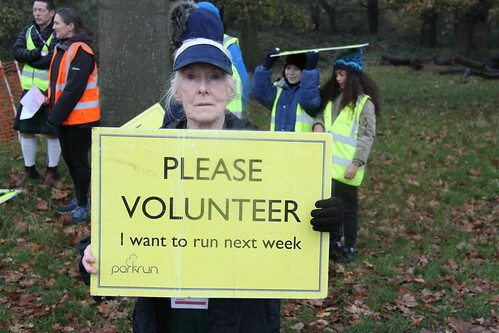 You can do so by having a look at the roster at http://www.parkrun.org.uk/tootingcommon/futureroster/ and sending an e-mail to tootingcommonhelpers@parkrun.com stating which role you’d like to try out. You too could be a hero in hi-vis! For this week’s parkrun we marked the 14th International parkrunday, which celebrates what was then an informal 5k time trial taking place in Bushy Park in South West London on 2 October 2004. 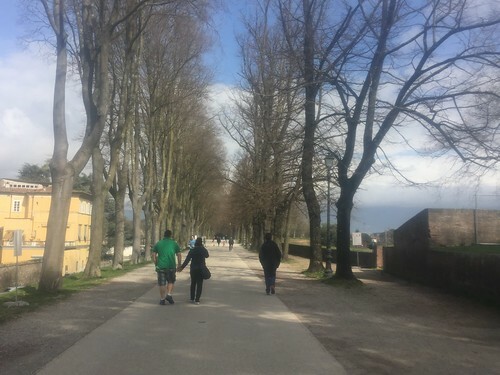 It has now has grown into a global phenomenon, with more than half a million runners running, jogging or walking around their local park each Saturday morning in twenty different countries around the globe. And this week I decided it would be fitting to make my fourth trip back to the place where it all began! Needless to say, things have changed considerably at Bushy parkrun since the first event. In 2004 there were only 13 people together on the start line, but for 2018 1540 people did so - their third biggest attendance ever. Before the run itself the annual awards were handed out, with Vassos Alexander of BBC Radio 2 (and one of the hosts of the parkrun “Free Weekly Timed” podcast) doing the honours. A film crew from Sky News came along to record proceedings too. 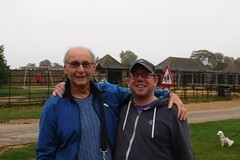 As always, I thoroughly enjoyed my trip to Bushy Park. 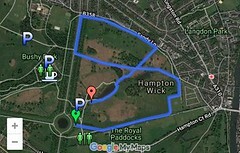 The course itself has changed over the years but has always been a flat one lap route around the eastern section of the park. The current route resembles a butterfly in shape, and as such has lots of twists and turns to keep you on your toes. Organisation at the finish by the big oak tree is quite superb too. The event team have developed a “double funnel” to manage the number of finishers they have now, and the team of 10 funnel managers do a great job of keeping runners in order until they have received their finish token. 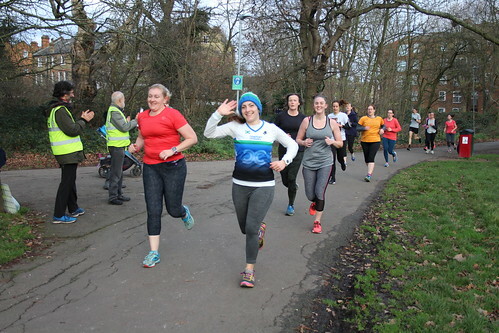 Bushy parkrun is also a great place to go for a milestone run or a catch-up with other parkrunners. 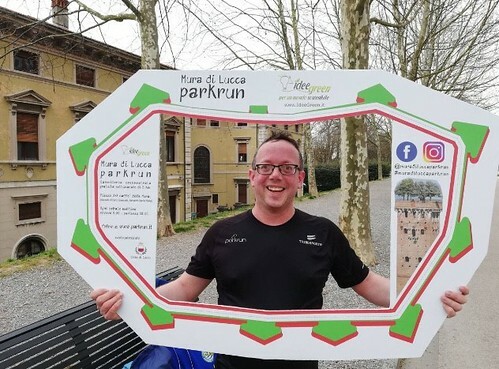 Quite by chance, regular Tooting Run Director Mike Morfey had chosen today as the date to complete his Bushy pilgrimage, and he had opted to do so to meet up with the people he met on the organised parkrun holiday to Sicily earlier this year (a write-up of which is available here). 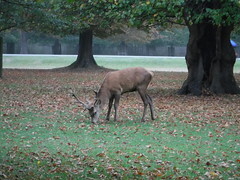 Finally, another thing to note about Bushy Park (and another great reason to visit) is that it is a deer park. 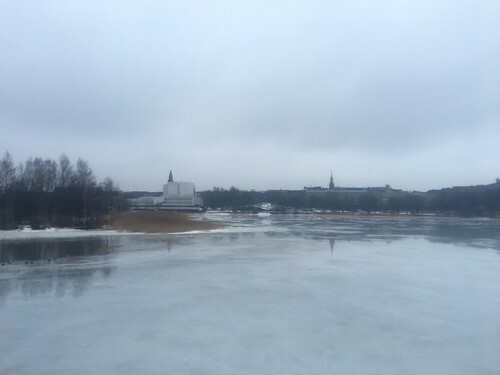 There are about 320 roaming freely, and you are likely to spot stags and does on your pre-run warm-up. 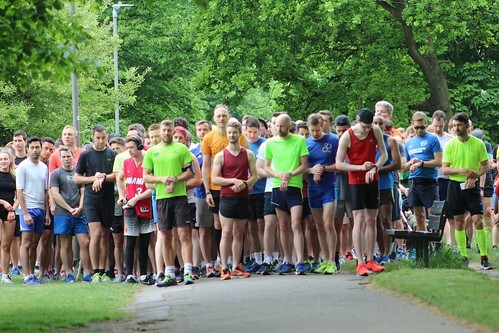 This week 640 people ran, jogged and walked the course, of whom 105 were first timers and 40 were running their first ever parkrun. 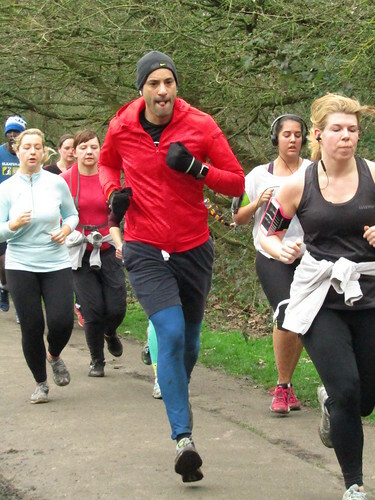 113 recorded new Personal Bests, and representatives of 41 different clubs took part. Jon HARRISON (SM25-29) of Chorlton Runners was first over the line in a new PB of 17:10 – an improvement of just over 1 minute on the time he set last month. 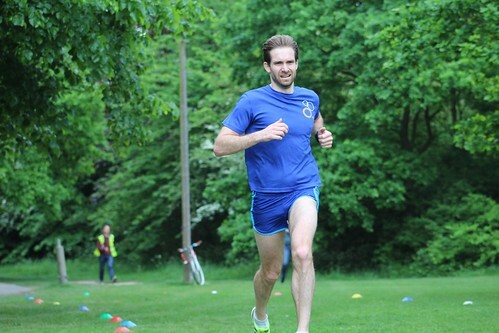 Matthew ROBERTSON (SM30-34) of Herne Hill Harriers was second over the line in a new PB of 17:15. Nick BESTER (SM25-29) of Herne Hill Harriers was third over the line in 17:33. 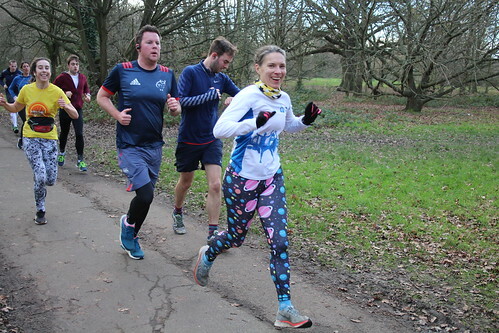 Ruth DERVAN (SW30-34) (VW35-39) of Clapham PiONEERs was first over the line in a new PB of 20:21 – her third successive PB in as many Tooting Common parkruns. Lyndall ALSTON (VW35-39) of Clapham Chasers RC was second over the line in a new PB of 20:58 – an improvement of 7 seconds on the time she recorded this time last year. 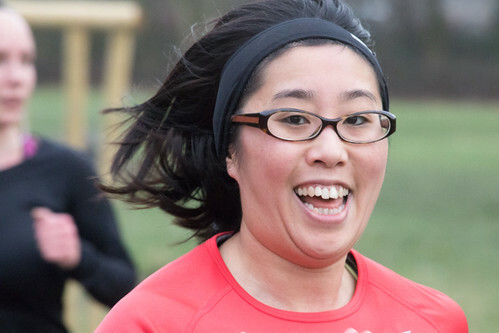 Ghiselle GREEN (SW25-29) was third over the line in 21:08 in her first ever parkrun. Milestone shout outs are due to Jade MOUNTAIN, who ran her 100th parkrun with us today, and Tristan KAY and Hannah TANKARD who both ran their 50th parkruns. Hannah also marked the occasion with a new PB. Finally, Ned KLASENER ran his 10th parkrun as a junior. - Ros HOUSDEN ran with us for the first time since June and made an improvement of 1 minute and 5 seconds on the time she set then and has a new course best of 30:52. Welcome back, Ros! 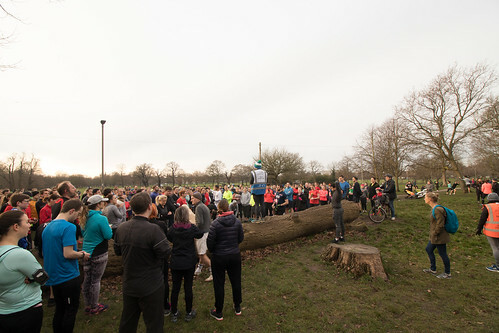 The weather fairies did an excellent job on the morning of 12 May, allowing the 116th Tooting Common parkrun to take place under cloudy spring skies while holding back the rain which was to follow later on in the day. 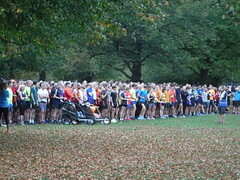 The good weather drew out a bumper crowd of 675 runners, the fourth highest turnout in our history. 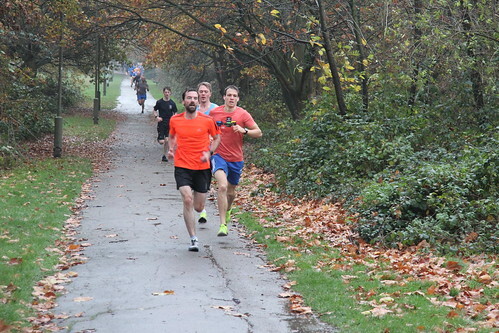 Of those 675 there were 85 first timers, 47 of whom ran their first ever parkrun. I hope that you all enjoyed our event and that you come back again soon! The more observant of you might also have noticed a group of people running round in party mood and dressed in red and black striped tops. 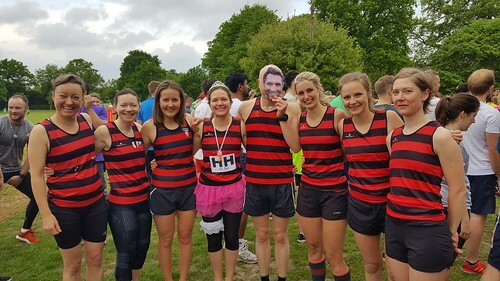 They were all on the hen do of Herne Hill Harriers member Helen COUCHMAN, who will be marrying club mate Daniel HALLAM next month. Their first date was apparently to a Harriers event approximately two and half years ago. At that time Dan was a member but Helen was not. She has been ever since, though. 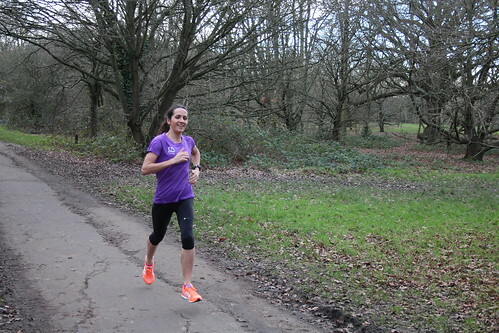 Helen is a keen parkrunner and is targeting improvements in her 5k time at the moment. However, for today the hen Harriers decided to fly together round our course a bit slower than normal and had the most fun they've ever had at parkrun. 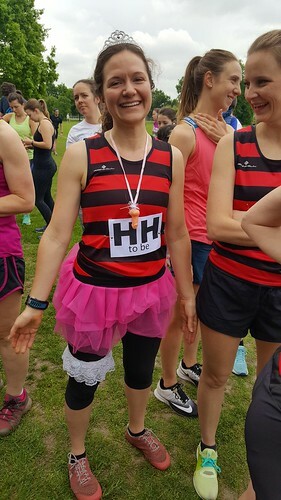 As part of proceedings for the day, Helen had also been tasked by her club mates with picking up faces of her husband-to-be dotted around the course, and I gather she managed this with ease. 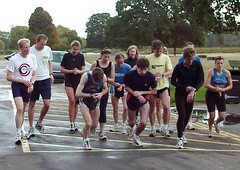 They all then headed off to the Lido afterwards, which is a great idea for a post parkrun workout. The pool temperature is still a bit chilly at the moment, though – as the hen party soon found out! For the men, Luke PIKETT of Clapham Chasers RC finished in 16:56 and was first across the line today – the fifth time he has done so at our event. Juan David CASASBUENAS was not far behind him in second place with 17:03, which represents an improvement of 13 seconds on his previous course PB. And the third placed finisher was an unknown, which is a good time to remind you all not to forget your barcode as you won’t get a result without it. 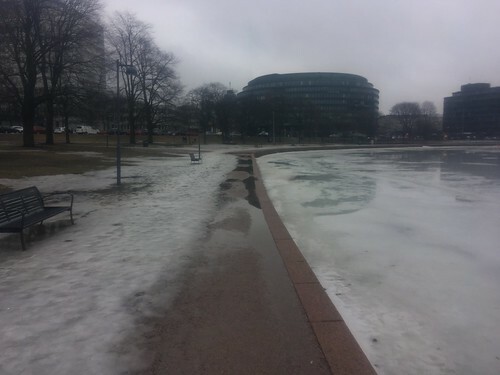 DFYB, people! Alexandra MCCLELLAND was first home for the women in 20:13, and in doing so recorded a new course PB for the first time since October last year. Helen’s club mate Lara LANGSTON was second with a new PB of 20:44, and not far behind in third was Sally GREENWOOD, who like Lara went sub 21 for the first time at TC with 20:56. Great work, folks! A total of 153 people achieved new PBs today. And aside from those referred to above, there were some other excellent performances worthy of note. Anna WYNNE-WILLIAMS, Carolina MOUNTFORD and Amy DILKS all smashed the 30 minute barrier today, improving their previous best times to finish in 29:32, 29:39, and 29:52 respectively. Regular marshal Sophia HAMILTON smashed her previous best by just over a minute to finish in 26:07, and Wioletta MARZEC-SUPEL beat last November’s time by an impressive 1 minute 48 seconds to set a new best of 27:37. 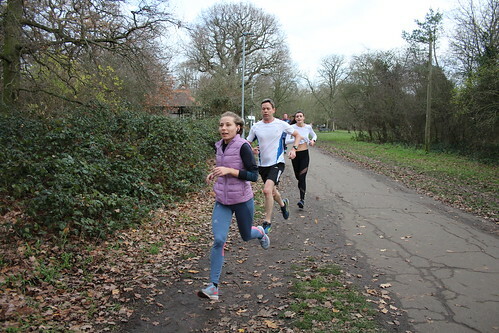 Junior runner Hana MUKADAM, accompanied by Jolanta Urbanek, bettered the time she set last year by 5 seconds to 38:26, and brothers Oscar and Oliver WILKES both achieved their fourth successive PB at Tooting Common by registering 28:27 and 28:30 respectively. Dorset Doddler Nick BROOKE’s new PB of 19:46 was also the highest age-graded result of the day – a superb 84.82% – and Zoe KINGSMELL of Blackheath and Bromley Harriers AC not only took today’s gong for most parkruns by completing her 294th with us but also improved her course best by an astonishing 3 minutes 44 seconds to finish in 24:51. 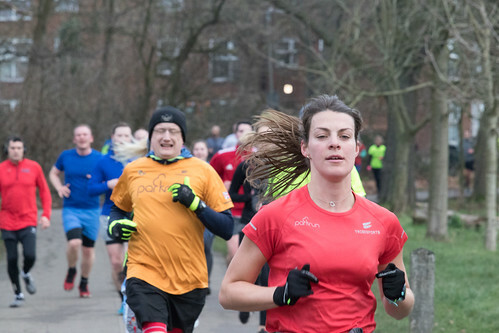 Finally, a special mention must go to Emily GAILER of Team Tangerine, who in her second parkrun with us bettered the time she set three months ago by a staggering 10 minutes and 36 seconds and has a new PB of 29:46! Bravo to you all! Event 116 was also a special one for Andy C SAXTON, Richard GERAGHTY and Emily KIRWAN, all of whom ran their 50th parkrun with us today. Congratulations, guys, and don’t forget to claim your parkrun milestone shirts – when they’re available, that is! 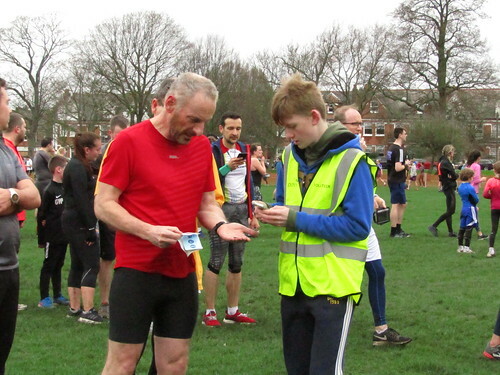 In terms of visitors from other parkruns, Crystal Palace stalwart Will H H DAVIS ran his 72nd parkrun with us today, finishing in a very respectable 19:59, and Brockwell and Burgess regular Douglas THOMSON ran his 55th, recording 23:12. We also welcomed Georgina O’BRIEN, a regular from Ashgrove parkrun near Brisbane, who with 30:29 ran the fastest parkrun time she has ever managed with us. 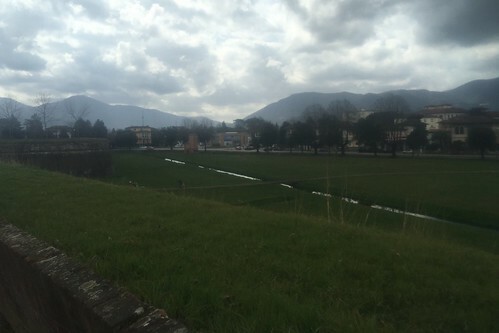 We hope that you enjoyed your visit and that you come back again soon! Three Cheers for the Voluncheers! Finally, as RD for the day I’d like to pay tribute to the 28 wonderful people who helped make my job as easy as it was – Mattie ALLESTON, Commeletia ALLISON, Isobel BEINT, Gareth BRIGGS, Malcolm CAMMACK, Emily COOPER, Andy DE SANTIS, Donald FREEMAN, Anthea GORDON, Stuart HAMILTON, Michelle HARMAN, Abigail HERMON, Sarah HILTON, Rebecca HUGGINS, Alexander JOHNSON, Imogen JOHNSON, James JOHNSON, Marian KELLY, Simon James LEWIS, Yvette LEWIS, John LININGTON, Orla MCLARNON, Michael John MORFEY, Robert STREET, Andrew THEEDOM, Andrew WARDEN, Marie-Anne WONG and Phil WRIGHT. Thank you, guys – we couldn’t have put on the event without you, and you ensured a hen party had a great start to their weekend! 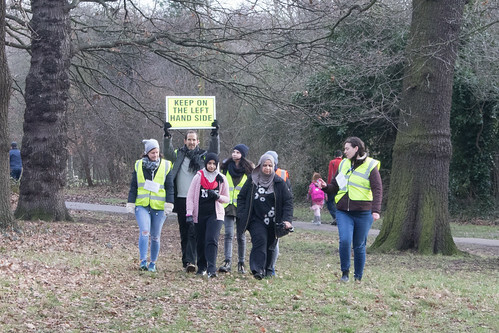 If you are interested in volunteering at Tooting Common parkrun in the future, then please update your parkrun account options to receive our weekly volunteer appeal e-mails. You can do this by following the “Manage My Profile” link you will find in any of your run result e-mails. Once in “My Links”, you should then click on “Email options” to opt in for receiving volunteer appeal e-mails. 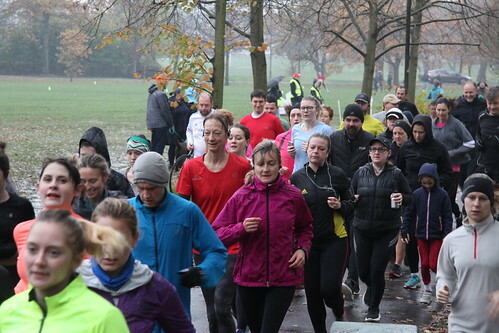 After the rain, wind and grey skies of the previous week, it was great to see the sun come out for Tooting Common parkrun’s second anniversary event. 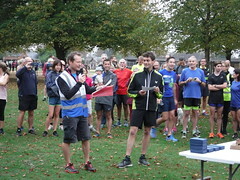 Such occasions are usually a time for reflection, and in the customary briefing Run Director Simon LEWIS reeled off stats demonstrating the achievements of our runners. You have so far collectively managed 42,000 5k runs (equalling a total distance of 210,000 km) and have achieved over 8,000 Personal Best runs in that time. Congratulations, folks! 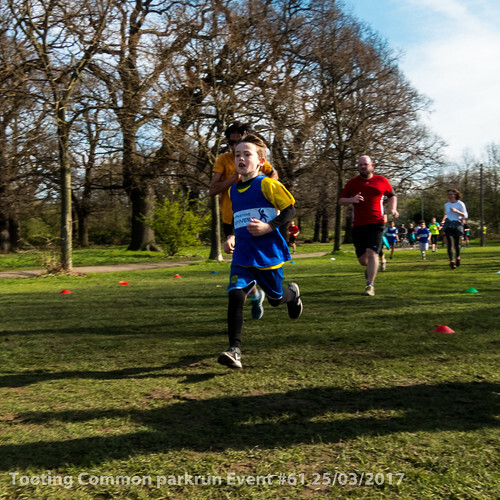 However, there are other points to note about Tooting Common parkrun that show how much it has become an integral part of community life. Since 30 January 2016, no less than 584 people have volunteered to help organise the event on 2879 separate occasions. These figures include 19 pupils from local schools who have volunteered on 247 occasions to complete the volunteering section of their Duke of Edinburgh bronze award with us. 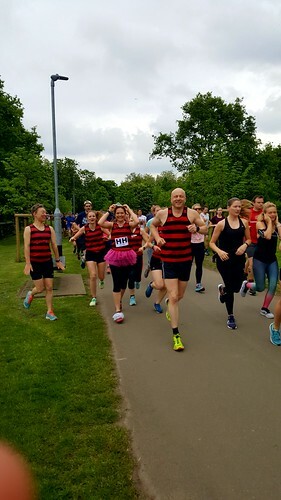 We have also had four local running clubs organise “takeover” events and present themselves to our runners with a view to encouraging them to become part of a running club structure. And we will be looking to invite other local organisations to lead more “takeover” events over next year. 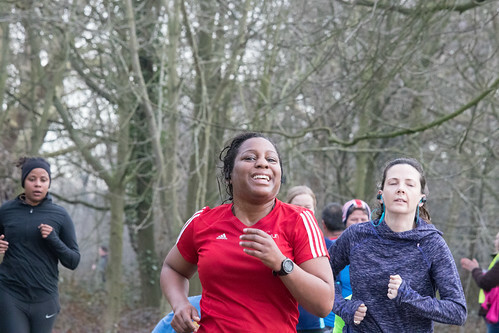 One of the aims of parkrun is to break down barriers to participation in physical activity, and Tooting Common parkrun has been working hard to realise this aim at community level. 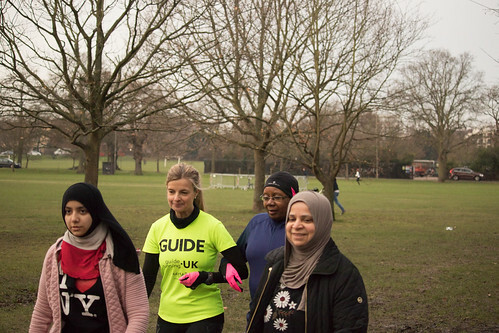 For example, two visually impaired runners came forward looking to take part in our event. In response to this demand, our team arranged a Sight Loss Awareness workshop run by England Athletics for our regular volunteers – many thanks to Jas DHALLEY and Emma HAINSWORTH for their efforts in making this happen. And we now have four visually impaired people running regularly with us, assisted by trained VI guides. Over next year, we will look to do more to encourage local deaf or hard of hearing runners to participate, given that we are now able to offer British sign language interpretation of our run briefs. We are very grateful to Darren TOWNSEND-HANDSCOMB for his help with this. We also look to ensure our event is as safe for our runners to participate in as possible. To that end, I would like to give thanks to everyone within our community who made a donation over the past year so that we could purchase a defibrillator. And regular volunteer Jen HUNTER led an excellent training session on how to use it for some of our regular volunteers. Some of us were also fortunate enough to be able to attend a basic first aid course this year – many thanks to John HELME for inviting us along. 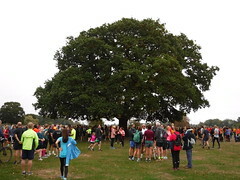 Finally, we would like to wish all our runners a healthy and happy 3rd year at Tooting Common parkrun and thank the wider community for welcoming us so warmly over the past two years. 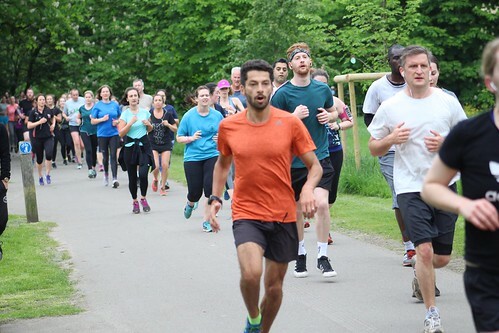 This week 725 people ran, jogged and walked the course, of whom 122 were first timers and 41 ran their first ever parkrun. Representatives of 41 different clubs took part. Danny RUSSELL (SM30-34) of Highgate Harriers was first over the line in 16:46. 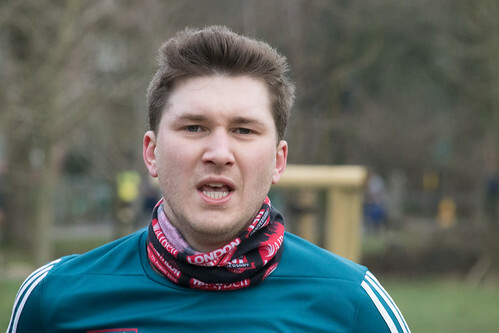 Alex HORTON (SM30-34) of Barnet and District AC was second over the line, recording a time of 16:57 in his first appearance at Tooting Common parkrun. Hugh TIBBS (SM30-34) was third over the line in 17:05. Rose HARVEY (SW25-29) of Clapham Chasers RC was first over the line with a time of 20:15. 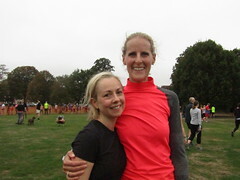 Claire COOPLAND (SW30-34) of Clapham Chasers RC was second over the line in a new PB of 21:11. Sarah LAWSON (SW20-24) of Winchester and District AC was third over the line in 21:19. 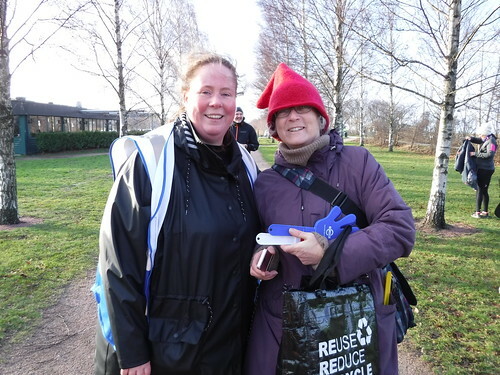 Congratulations to Commeletia ALLISON, who ran her 100th parkrun with us today, and Ninette FERNANDES, who ran her 50th. Commeletia had double reason to celebrate today as she also knocked 55 seconds off her previous course PB to finish in 27:52. Well done, ladies! 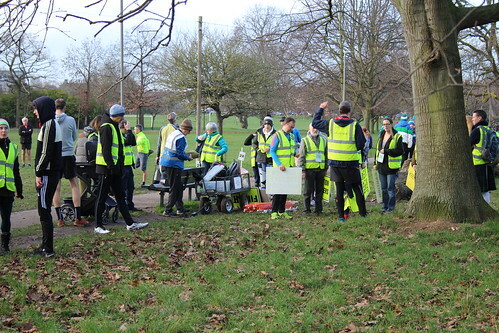 130 people achieved new PBs at Tooting Common parkrun today, and there were several standout performances worthy of mention. 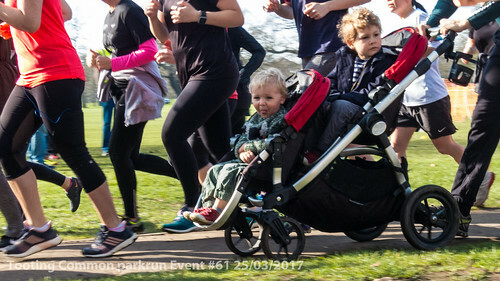 For example, Oliver HAMLET, Orissa LLEWELYN, Jalal MIAH and Kat BLAKE showed they have been working hard at sticking to their New Year’s resolutions – they all achieved their third PB in their fourth successive Tooting Common parkrun, getting 18:46, 29:42, 30:24 and 32:10 respectively. Regular volunteers Jennifer WOOLGAR, Mavis ORBAN and Hilary KNIGHT all recorded new PBs for the first time since 2016 with improvements of 1:22, 30 seconds and 38 seconds to get 24:15, 33:43 and 34:03 respectively, and Kate MACDOUGALL notched up her fifth consecutive PB, beating last October’s effort by 13 seconds to finish in 33:02. Hector WAKEFIELD returned to our event for the first time since last January and set a new best of 23:22, and junior runner Izzie S WARREN bettered her time from last November by an amazing 1 minute and 17 seconds to finish in 28:30. But the single biggest improvement of the week came from Duncan TEMPLE, who smashed the time he set two weeks ago by an astounding 4 minutes and 48 seconds and has a new PB of 28:49! Bravo to you all! 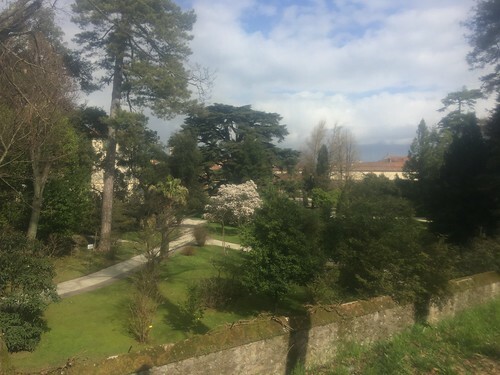 We are very grateful to the 35 volunteers who made this event happen: Mattie ALLESTON, Andrew ARCHER, Tom BAKER, Cecilia BOGLE, Jehan-Zeb CHESTER, Stuart COURT, Jaspal DHALLEY, Sandhya DREW, Oliver GREEN, Emma HAINSWORTH, Stuart HAMILTON, Sarah HILTON, Simon HOGG, Kieran HOUSER, Stiainin JACKSON, Thomas JEFFERSON, Ben JONES, Stan LAMBERT, Catherine LAW, Simon James LEWIS, Yvette LEWIS, Paula LUESHING, Carol MCCALL, Alessandra MCCONVILLE, Orla MCLARNON, Evie NOSWORTHY, Liam O'HARE, Georgina REEVES, Mark SHOTTON, Dylan SIMPSON, Victoria SMITH, Claire WALLS, Andrew WARDEN, Brian WIGGINS and Zoe WREN. 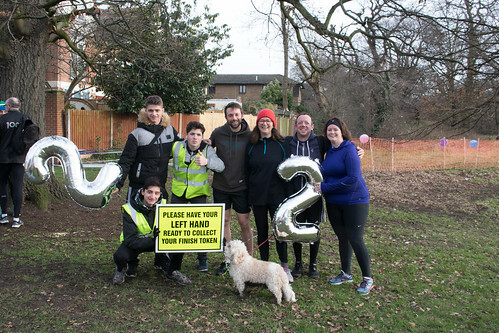 Happy Birthday to you, Tooting Common parkrun! 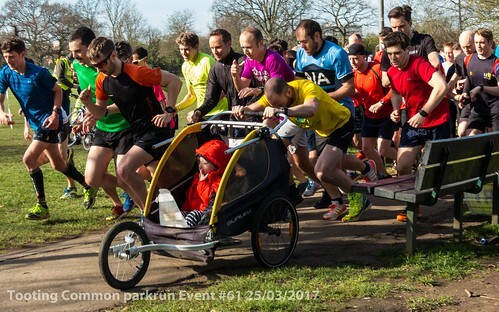 As Run Director for the 61st Tooting Common parkrun I was in the fortunate position of presiding over an event bathed in glorious spring sunshine. The good weather drew out a crowd of 480 runners, the fifth highest turnout in our history. 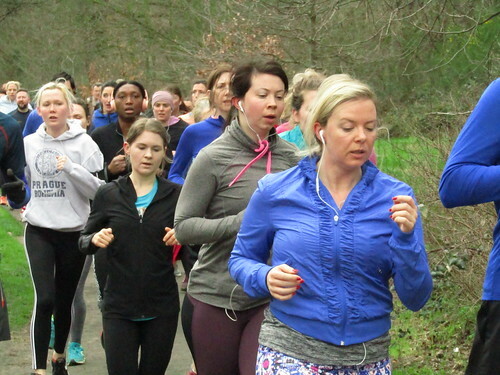 Of those 480 there were 82 first timers, 40 of whom ran their first ever parkrun. I hope that you all enjoyed our event and that you come back again soon! We also welcomed seven juniors from the Ravenstone Runners, a club based at the nearby Ravenstone Primary School and organised by our Event Director Simon Lewis. They train every Thursday morning in term time, with periodic completion of our event as an aim. 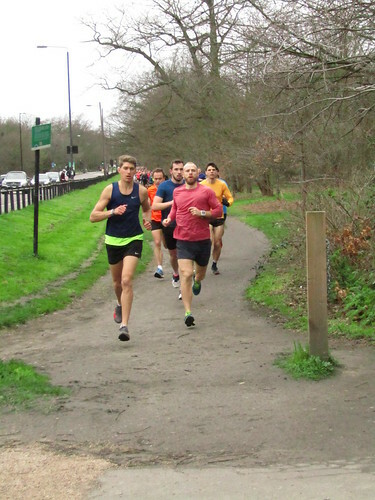 This Saturday was their third visit to the Common, and training must be going well if the amazing performances of their runners are anything to go by. For example, Max FITZPATRICK and Benedict HUGGINS both ran a sub-25 minute 5k for the first time, with times of 24:39 and 24:51. And Esther HUGGINS showed the biggest improvement on previous performance this week, bettering the time she got in June last year by an astounding 5 minutes and 7 seconds to finish in 28:20! Go Ravenstone! For the men, Geoffrey HOWELL was first across the line today in 17:25, running his second fastest ever parkrun and improving the course PB he set last year by 18 seconds in the process. 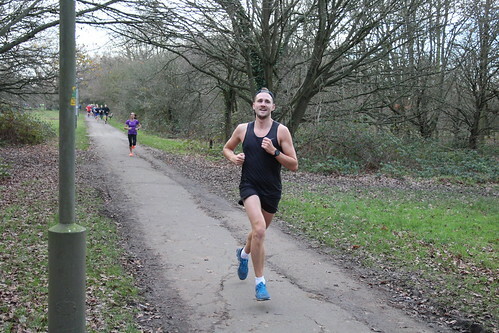 Nick BESTER of Boksburg AC took second place with 17:43 in his first parkrun in the UK, and Orlando BROOKE of Clapham Chasers AC took third in 17:45, an improvement of 19 seconds on his previous course PB. Georgia BEAZLEY-LONG was first home for the women in 21:19, bettering her previous PB by 9 seconds. 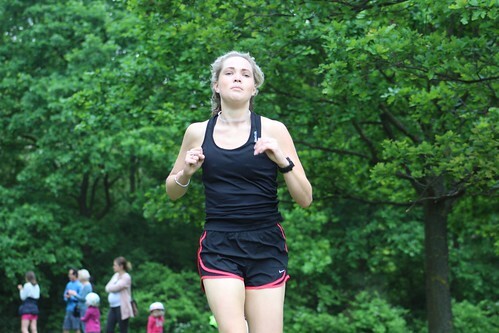 Lara LANGSTON was second with a new PB of 21:28, and not far behind her was Katy COSTIN, who on her parkrun debut finished in a very respectable 22:04! Great work, folks! 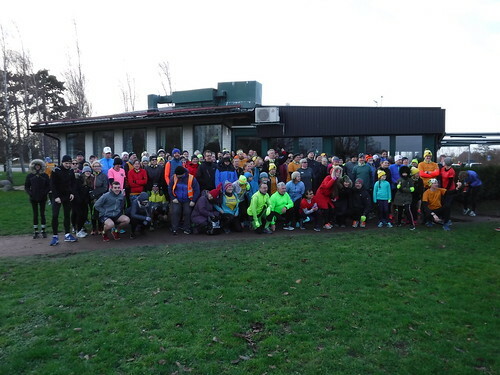 A total of 118 people (28% of the identified field) achieved new PBs today. And aside from those referred to above, there were some other excellent performances worthy of note. Josh WILCOX, Chris EVANS and Alex WATKINS all smashed the 20 minute barrier today, improving their previous best times by 28 seconds, 50 seconds and 14 seconds to finish in 19:34, 19:38, and 19:58 respectively. 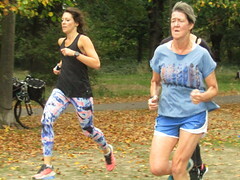 Sian DIXON and Katy BRENNAN both achieved their fifth successive PB in their fifth appearance at Tooting Common and also broke the 29 minute barrier for the first time. And Belgrave Harrier stalwart Patrick MCDOUGALL’s new PB of 18:52 was the highest age-graded result of the day – an impressive 78.18%. 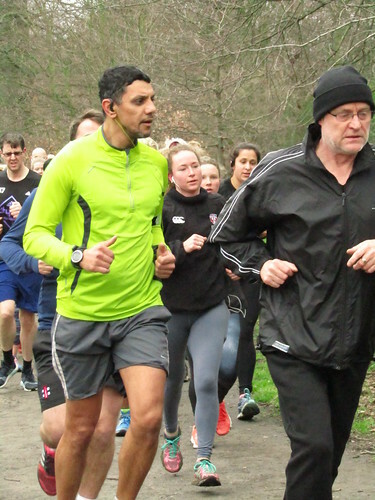 Finally, a special mention must go to Dason CHANDRAN, who in his second ever parkrun bettered the time he set two weeks ago by a staggering 4 minutes and 55 seconds and has a new PB of 21:25! Bravo to you all! 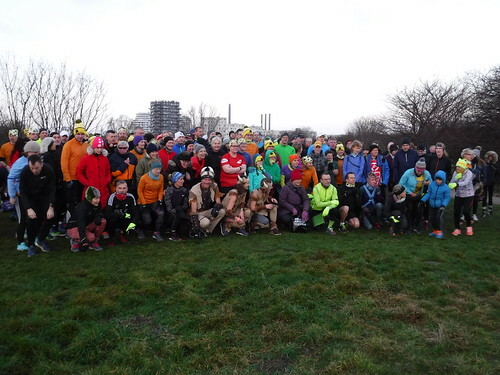 Event 61 was also a special one for Mile End regular Andrew TRAVIS, who chose Tooting Common as the place to run his 100th parkrun, and for Katie BARWELL, who completed her 50th parkrun today. Congratulations, guys – and don’t forget to claim your parkrun milestone shirts! In terms of visitors from other parkruns, Colwick regular Peter HUNT ran his 11th different parkrun and his 160th overall with us today, finishing in a very respectable time of 24:11. We also welcomed two regulars from Ebotse parkrun near Johannesburg in South Africa – second finisher Nick BESTER and his clubmate Taryn RETIEF. We hope that you enjoyed your visit and that you come back again soon! Finally, as RD for the day I’d like to pay tribute to the 30 wonderful people who helped make my job as easy as it was – Sophie BROOKE, Jo CIELUCH, Lucie CUSTANCE, Jaspal DHALLEY, Sophia DONKIN, Steve ELSON, Frank ELSTON, Heather GORRIE, Matthew GREEN, Stuart HAMILTON, Sarah HILTON, Kevin HUGHES, Thomas JAMIL, Amelia JEWELL, Ryan KAOU, Michael KAZANTZIS, Simon LEWIS, Yvette LEWIS, Michelle MCAREE, Alessandra MCCONVILLE, Carolina MOUNTFORD, Ciar O'HARE, Dillon O'HARE, Liam O'HARE, Saf RAHMAN, Peter SNOWDON, Roger STEPHENSON, Hanna STREET, Andy THOMPSON and Alan WILKINSON. Thank you, guys – we couldn’t have put on the event without you! 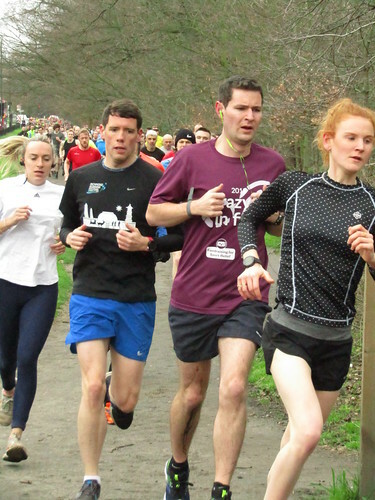 Of the 480 parkrunners, 419 were identified and 61 (13% of the field) were unknown. • The time needed to finish in the top 10% was 20:55, and the midpoint time was 26:33. 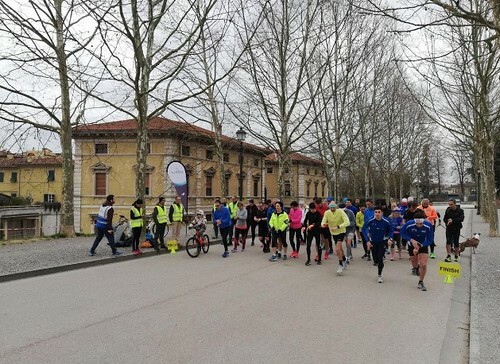 • 46 had completed at least 50 parkruns (11% of the identified field), of which 22 are members of the 50 club and 24 are members of the 100 club. 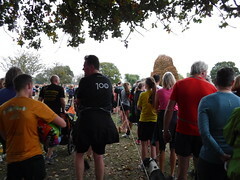 This week at Tooting Common I completed my 100th different parkrun (known in parkrun tourist circles as the ‘Cowell’). My journey to the 100 began at Wimbledon Common on 13 July 2013 and has taken me all around London and the Home Counties and into Suffolk, Norfolk, Dorset, and Cambridgeshire. 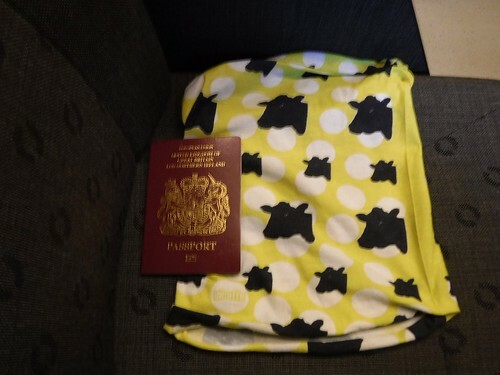 I’ve also been as far afield as Glasgow, Dublin and Paris for parkrunning. Finding his way to 100 .. . 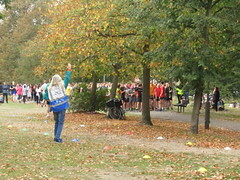 However, although I have thoroughly enjoyed going round seeing different parts of the country at 9:00 on a Saturday morning I am also acutely aware that my achievement would not be possible without the dedicated volunteers turning up week in week out to make sure that each parkrun event occurs.To that end, I have always made sure I volunteer on a regular basis and have been involved in Tooting Common parkrun since its launch this January. And I would encourage you all to give some of the different roles available when you are able. Volunteering is immensely satisfying, great fun and can do wonders for your self-confidence. If you volunteer 25 times at any parkrun, you are also eligible to apply via your parkrun accounts for the purple ‘25’ running shirt that you might have seen some runners wearing.Before I started volunteering at Tooting Common I had never done the Run Director role, and at the end of last year I would never have imagined that I would be able to get up and speak in front of over 200 people. But I have done so three times now. And if I can, you can too. Jonathan BATTYE (SM30-34) of Clapham Chasers RC, was second over the line in 17:50. Angus BEAUMONT (VM40-44) of Serpentine RC, was third over the line in 18:58. Katie FERGUSON (SW25-29) of Clapham Chasers RC, was first (25th overall) over the line in 20:40 - first time in 2 appearances. Marie KIRTON (VW35-39) was second (31st overall) over the line in 20:53. Kim TYLER (SW30-34) of Clapham Chasers RC, was third (42nd overall) over the line in 21:39. Tom CONLON (VM55-59) was graded 78.33% for the time 19:37 (8th overall). Anthony HARRAN (VM55-59) was graded 76.54% for the time 20:15 (18th overall). Craig WILLIAMSON (VM50-54) was graded 75.80% for the time 19:46 (9th overall). 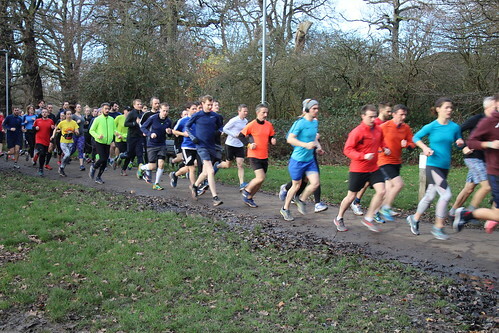 This week there were 330 runners, of whom 66 were first timers and 84 recorded new Personal Bests. Representatives of 22 different athletics clubs took part.